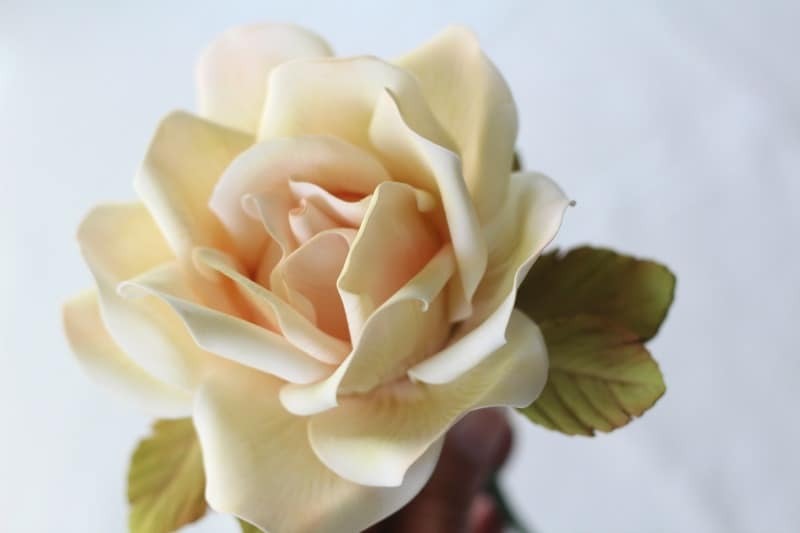 This detailed guide will show you how to creating the perfect gumpaste rose. It’s a step-by-step, easy to follow process that guides you through it with my best tips. 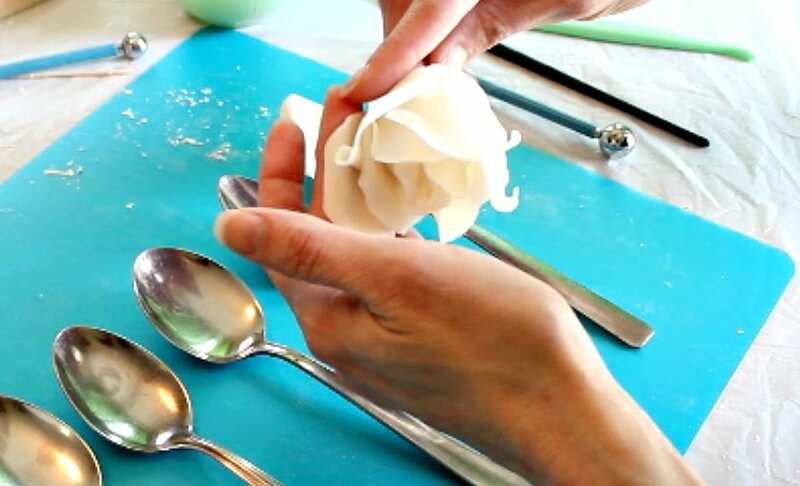 If you’ve been frustrated with making gum paste roses, it doesn’t have to be difficult. 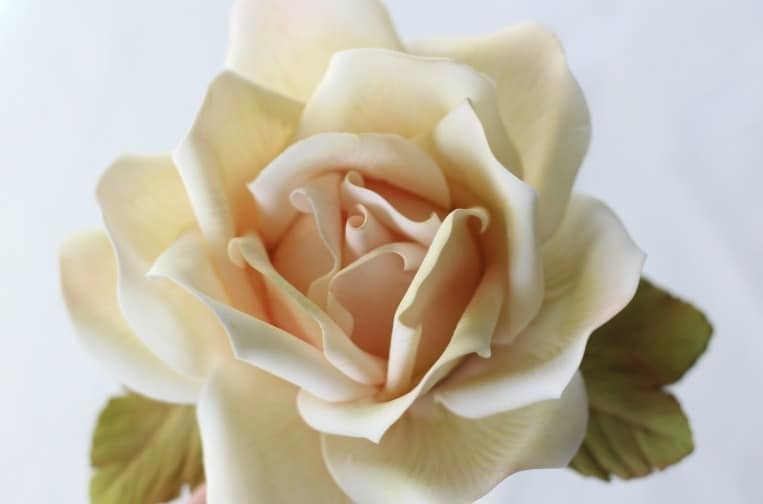 There are tips and tricks for sugar roses that really make it simple and possible to create beautiful roses for your cakes. 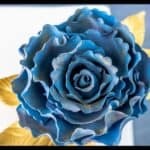 Several weeks ago, I asked a question on facebook, instagram and the weekly email about whether you would like to see how to make a large gumpaste rose. I got a good response, so I decided to put a tutorial together for you. In true Kara fashion, I couldn’t just slap it together. I’m a detail person and I wanted to give you a good in-depth guide. This is a BIG tutorial, but I wanted to give you ALL the details. There’s also a video plus a free printable quick reference guide that you can download below. This post is the first of a three part series. After you’ve completed your rose, just click the next title on the list to continue on. Here’s the list of each post. Ok, moving on to actually making the gumpaste rose. First I’ll say that there are a multitude of ways to make a rose. I’m going to show you what I do. Hopefully it gives you a great starting off point and you can adjust it to what works best for you. I’ve written instructions below with screen shots. I’ve also included the supplies you’ll need plus some extra tips. There’s also a narrated video below, so you can actually see it being made. Still with me? Ok, let’s get started. Don’t forget, there’s a video at the end that will show you all the steps. First of all, some people like to make their rose buds out of gumpaste. If I’m making a small rose, that’s fine, but it really makes for a heavy flower when you’re making a large rose. Other’s prefer to use the styrofoam cones you can buy at cake decorating supply stores. None of the places that are located near me, keep those in stock and frankly, sometimes I just don’t think ahead to order them. I came up with this method of just using a one inch styrofoam ball and it works just as well and they’re so much easier to find, plus they’re fairly cheap. Next squirt in some hot glue and insert your wires that you taped together. Let it firm up fully. Again, we’re using styrofoam, so that it won’t add a bunch of weight to your flower. We’ll be using the three largest petal cutters in the set. First you need to sprinkle cornstarch on your rolling mat, so your petals won’t stick. Then roll out your gumpaste super thin. If you’ve got a pasta roller attachment, I like to roll them out at about the number five setting. 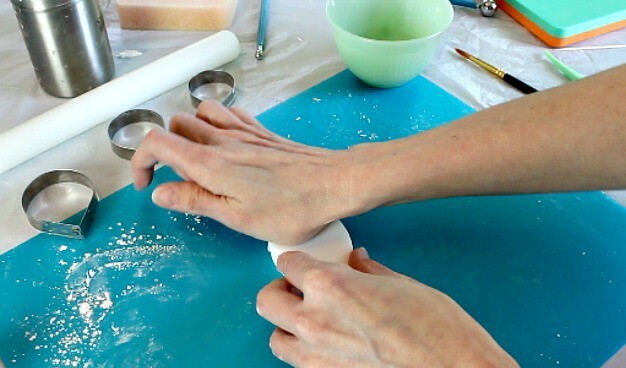 If you don’t have one, just use your small fondant roller. First I’ll say that I usually widen my petal cutters a bit. I just pull them apart a tad. Take your largest petal cutter, I know it sounds weird to use the largest cutter, but just trust me, and cut out one petal. This will be your bud. 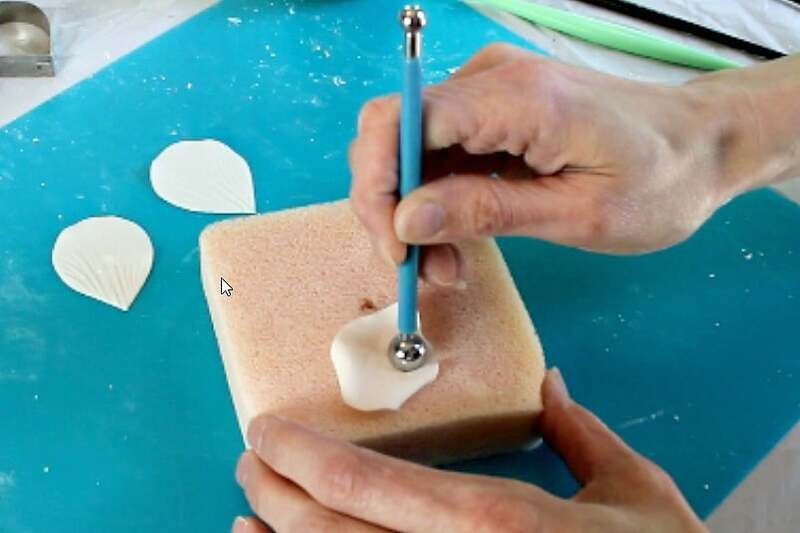 Use your foam mat (the firmer one) and thin the edges with either a ball tool or your fondant roller. Now, add the petal to the veiner and press. Attach the petal to your styrofoam ball with a bit of water. Just wrap it around and let the cone stick up from the ball. 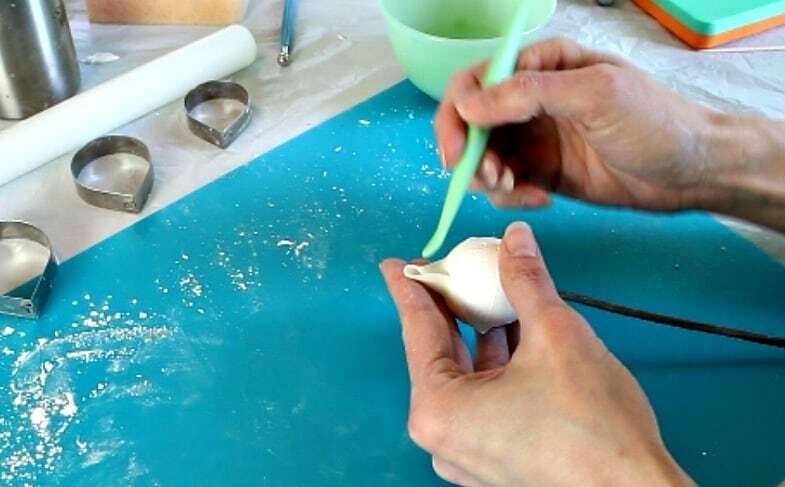 Use your fondant tool to help you adjust it. It’ll take some fidgeting to get it just right. 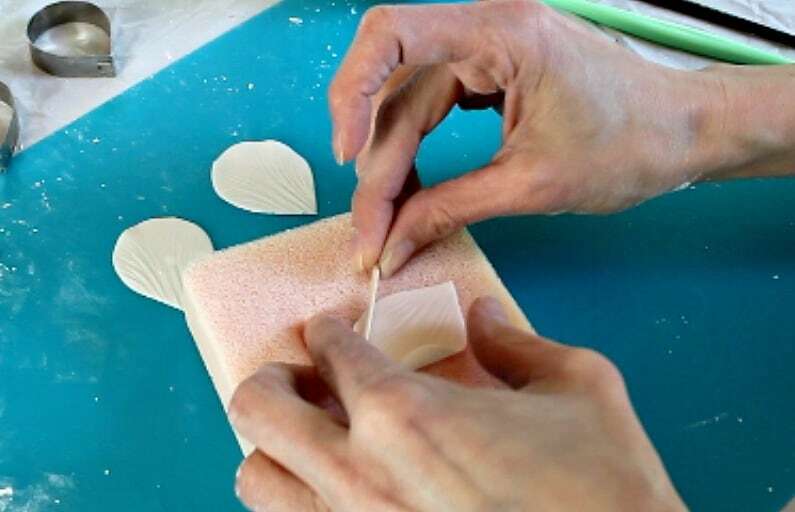 Now just stick the flower in a block of foam while you work on the next petals. For the first round of petals, roll out your gumpaste like you did for the bud. Now, use the smallest petal cutter and cut three petals. 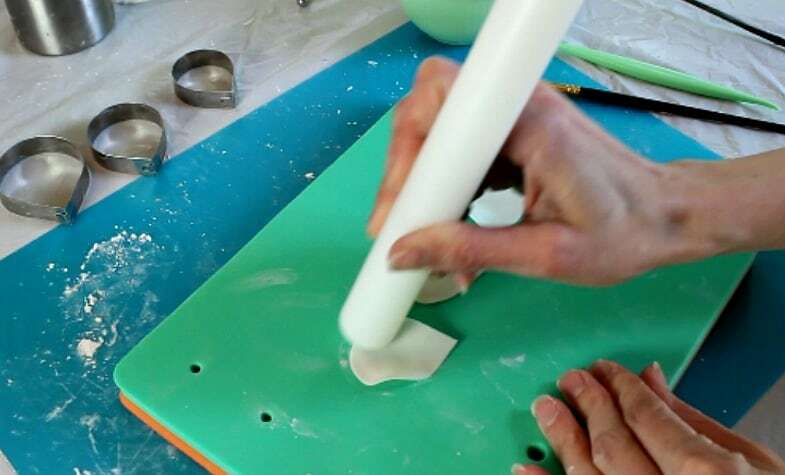 Thin the edges with your fondant roller. 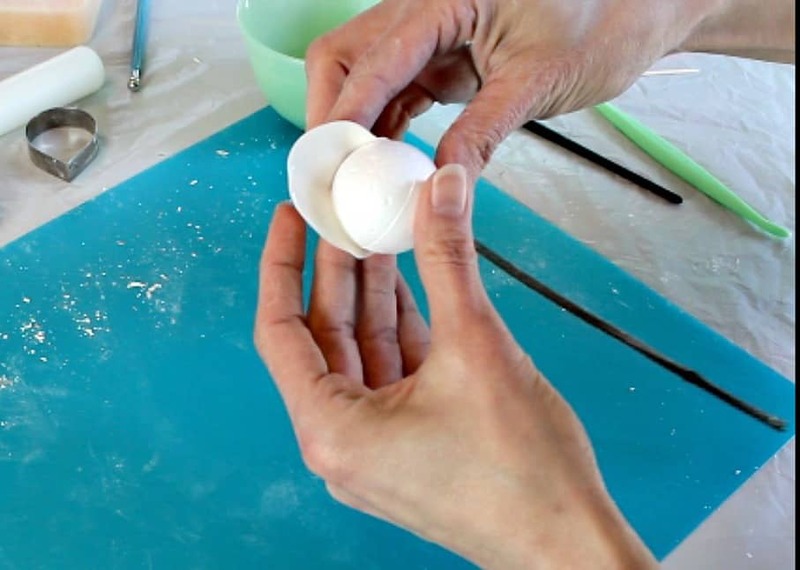 Use a toothpick to curl the edges back a bit. 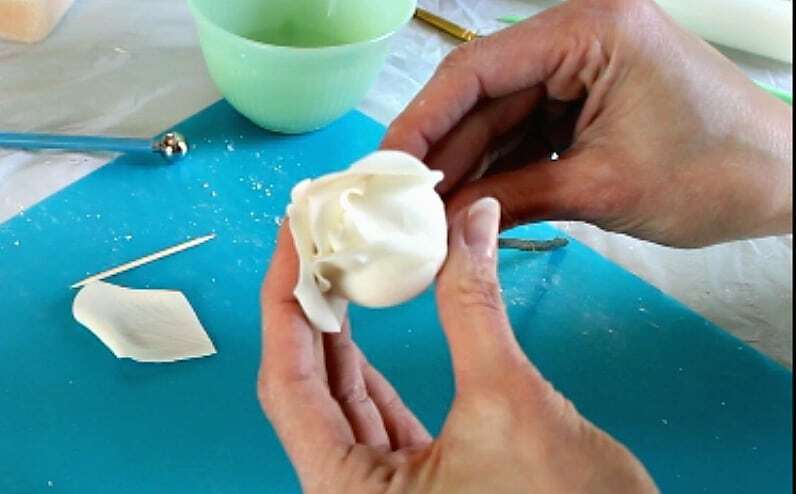 Now turn the petal face down on the soft foam and use a large ball tool or your fondant roller to cup the middle a bit. Attach the petals around the bud with a bit of water. The curls will be facing out. Try to overlap them a bit if you can and make sure the top of the petals are a little bit higher than the bud you just made. 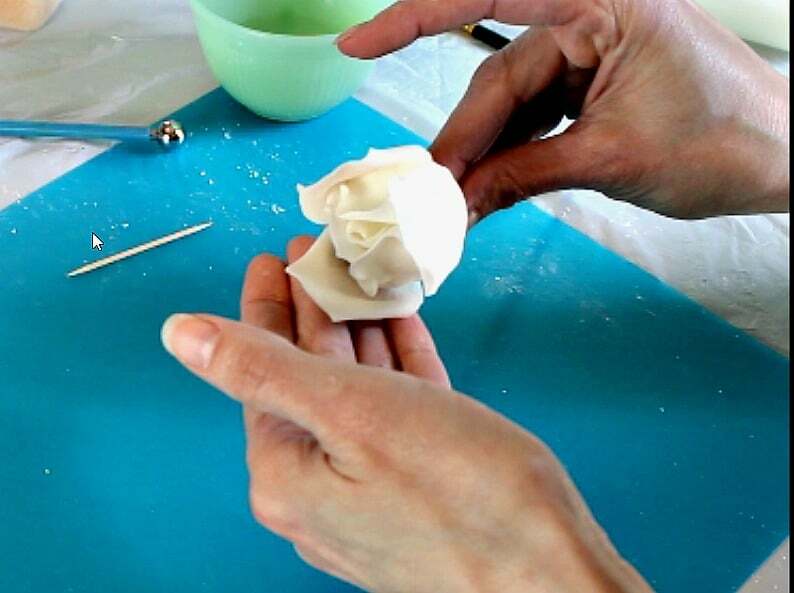 Now, set the stem of the flower into the foam while you work on the next round. 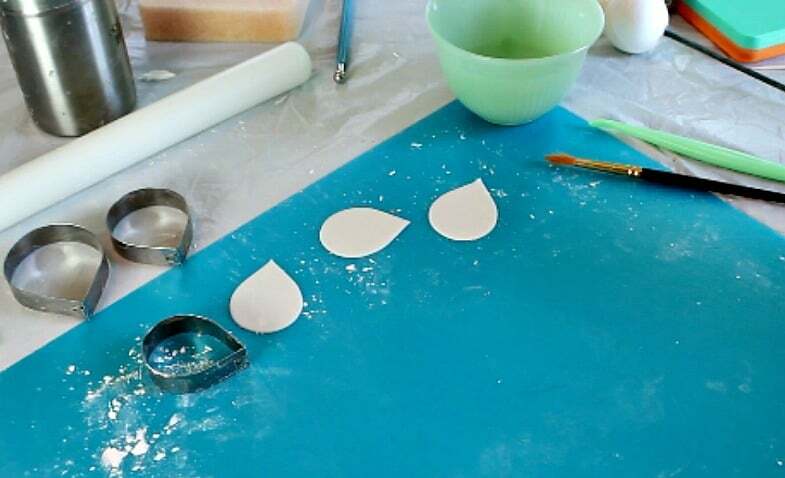 For the second round of petals, roll out your gumpaste like before. 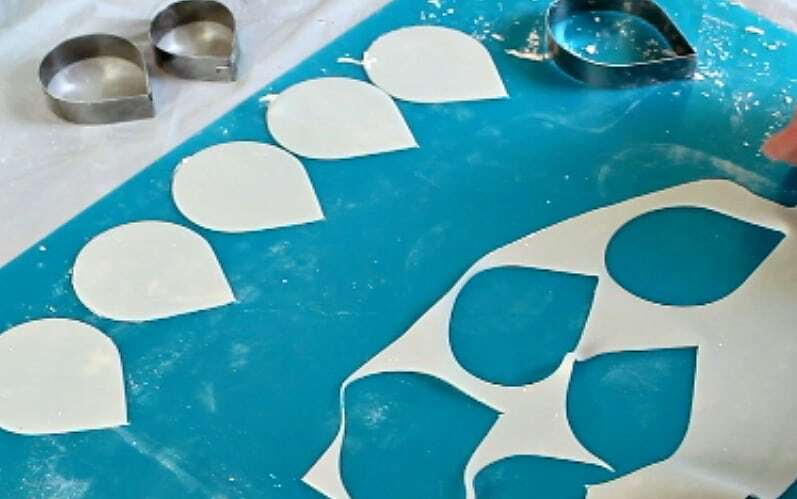 Use the next largest size petal (your middle size) and cut out three petals. Thin the edges and vein them. 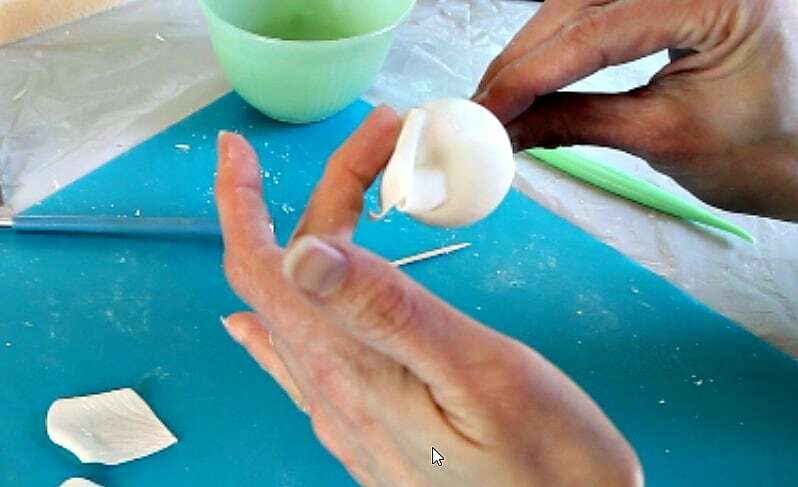 Use the toothpick trick and curl the edges, then turn them face down and cup the middle with your ball tool. Now just attach these like you did before. Make sure to attach each petal where the petals you put on earlier meet up. Don’t worry about the bottom of the styrofoam ball right now. It’ll eventually get covered. 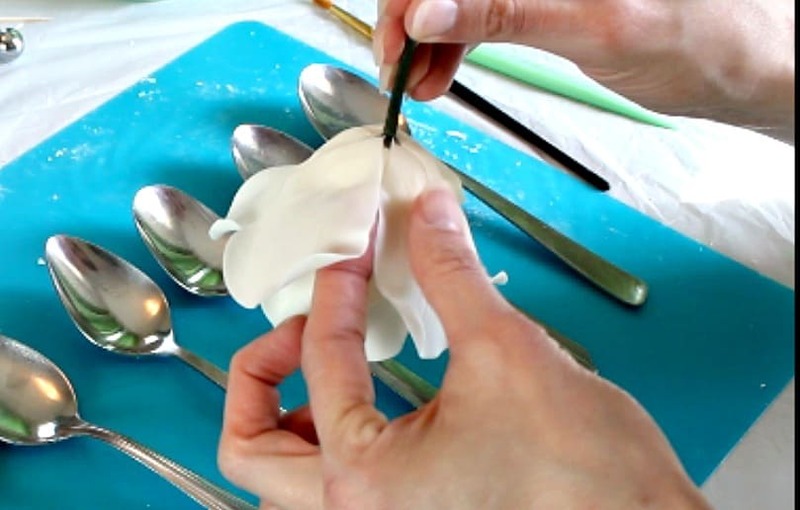 Once those petals are on, stick your flower in some foam and work on the next round of petals. On this row, use your largest petal cutter and cut out five petals. 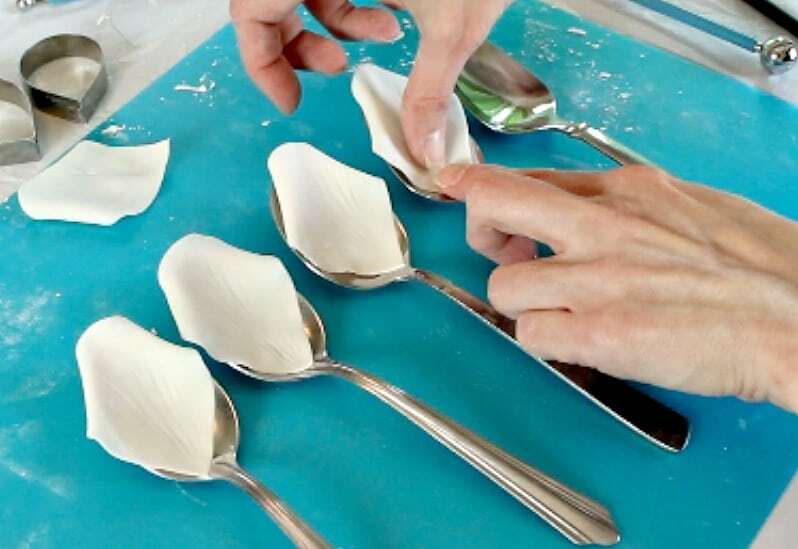 Do the same as the other petals by thinning the edges, veining them, curling the edges and cupping the middle. We’re adding one more step here. 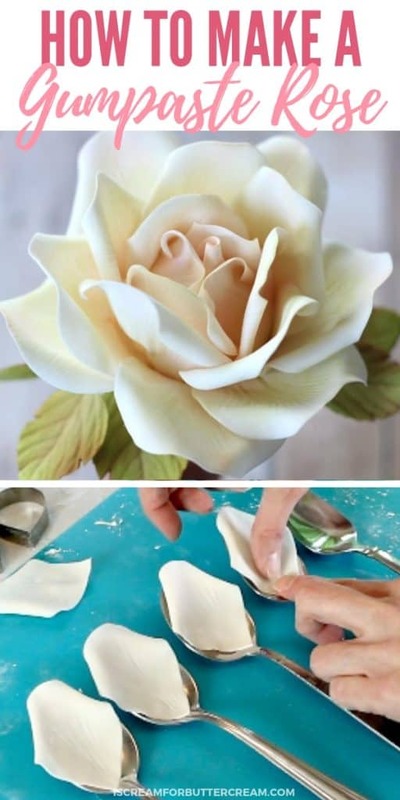 Take five tablespoons and lay your petals on top of them. 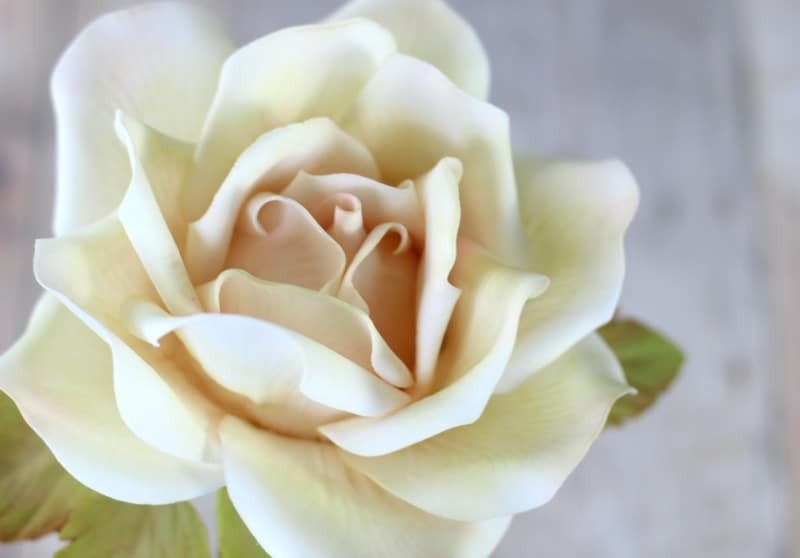 Make sure the curled edges of your petals are facing down. 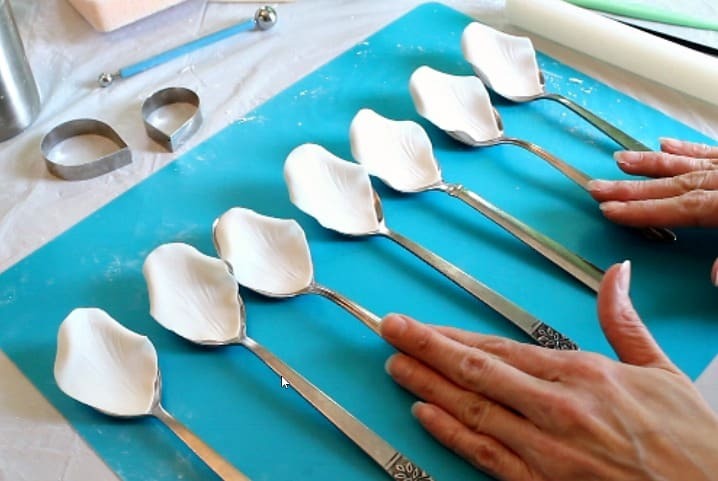 Leave your petals on the spoons for about 15 – 20 minutes or so to let them firm up a bit. Next, just attach them to the rose with a bit of water. You don’t need to add water to the entire petal just the bottom and up the sides a bit. Make sure to overlap them when you attach them and make sure the tops are level with the row before them. Now let your flower dry a bit while you work on the last round. 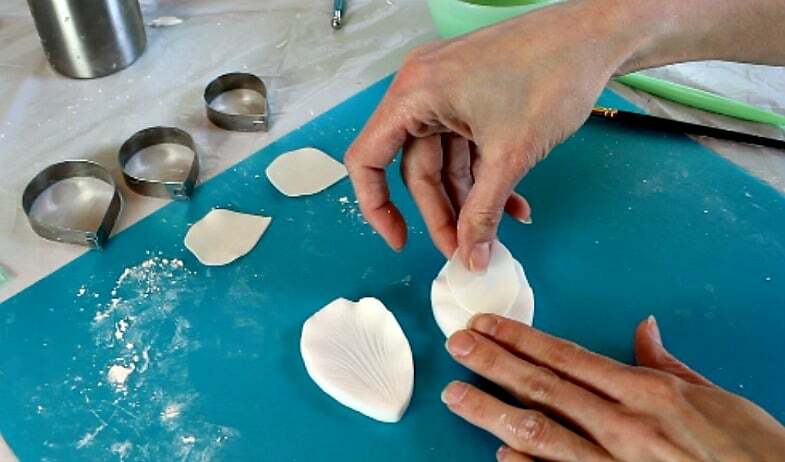 Use the largest cutter and do the same thing as the step before except cut out seven petals. Thin them, vein them, curl the edges and set them on tablespoons the same as you did before. Let them set up for 15 – 20 minutes. Now just attach them to your rose and make sure to overlap them as you add them. At this point, it’s easiest to turn your flower down and attach them. For this row of petals, the tops of the petals need to be a little lower than the petals before. I find that when I attach them while holding the rose upside down, that if I just line the point of the petal up to the bottom of the styrofoam ball, it ends up being about the right height. 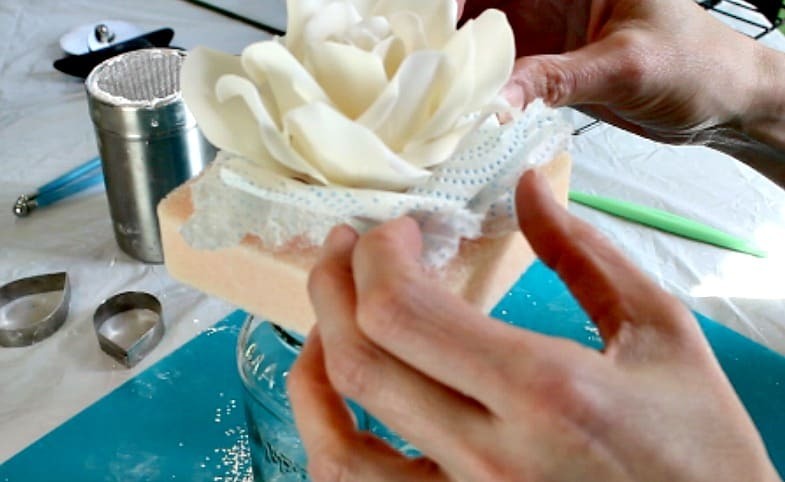 Once you add these flowers, you won’t be able to just stick it back into the foam or the petals will flop down. You can bend the wire and hang it over a taller cooling rack or you can set a piece of soft foam over a tall glass and poke the wires through it and let the rose sit on top of the foam. If you go that route, just add some bits of foam or paper towel under the rose petals to keep them from fall down too much. 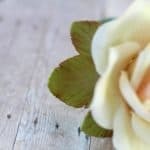 This method will give your rose a more open look and it’s what I prefer. And now to the video! 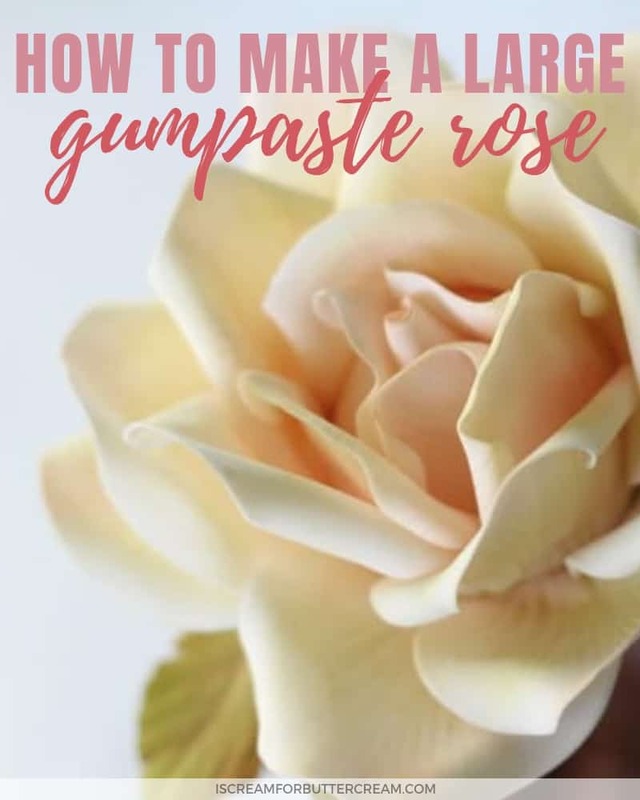 Want a free printable quick reference guide for making the large gumpate rose? Subscribe below to download it for free! So you made it through! Yeah! I know I gave you A LOT of detail here, but I wanted to try to make it as clear as possible. My most important tip is to get your petal height correct. 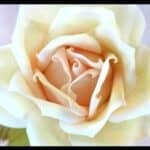 That will make or break your rose.If the middle is too high it just looks weird. The first row just a tad higher than the bud. The second row higher than the one before. The third row the same height or a bit higher than the second row. The fourth (last) row, lower than the third. Thank you so much for sharing your info with us!! I can’t wait to make a rose and I hope it turns out as well as ur!! Hey Karen, you’re welcome and thanks for the nice comment 😉 The first couple times you do it, you might need to fiddle with it a bit…it just takes some getting used to, but you’ll get in a groove. You should have seen my very first rose…it looked terrible, but I was so proud. 😉 Let me know how it goes! it is so beautiful. 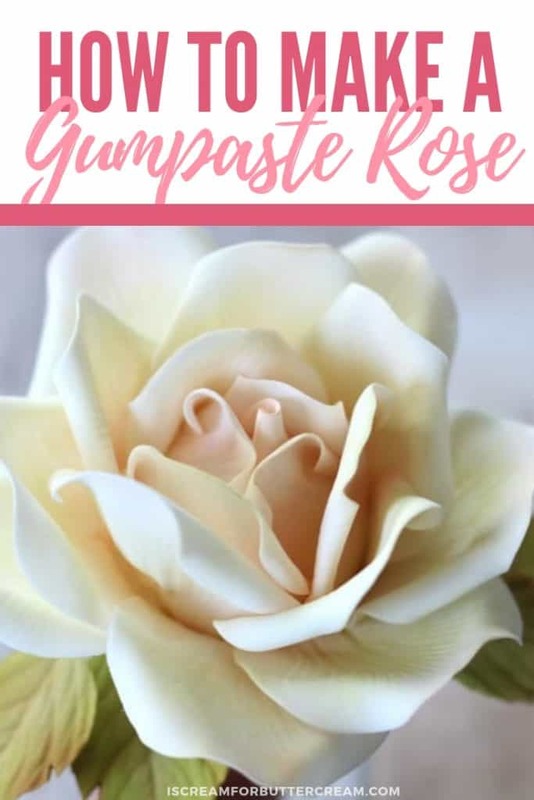 I make gum paste roses but your tutorial made a lot of difference. thank you so much for posting this video. you can see some of my flowers on my face book under Art and Craft. I have not made a rose before it’s looks easy,here I ll try it.thank you so much. Please i need a recipe for fondant icing, and also red velvet cake.thanks for your time. It’s a tasty fondant and works really well. Hey Emily! That’s great! I’m so glad my tutorial helped ? If you’d like to send me a pic, you can send me an email if you want. My email is kara@iscreamforbuttercream.com. I’d love to see it! I have been trying to make roses for the last two years and have never been pleased with what I have made. Today I followed your tutorial and for the first I am absolutely delighted with the result. I have a beautiful rose and am looking forward to making many more. Thank you so much. Just wondered roughly how much flowerpaste is required to make one of your lovely roses. Hi there, I’ve never really measured how much gumpaste it takes for the rose. I usually buy my gumpaste premade in a package and that lasts me awhile. I just pinch off bit by bit to make the rose. If I have to guess though, I’m thinking probably a palm full. You’ll be rolling the petals out pretty thin, so it ends up going a long way. Hope this helps! Thank you from New Zealand! 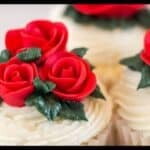 Is it ok to sit gumpaste flowers on top of buttercream icing or with the moisture in the icing make them soft and collapse them? Hi Tracey, That’s a good question. 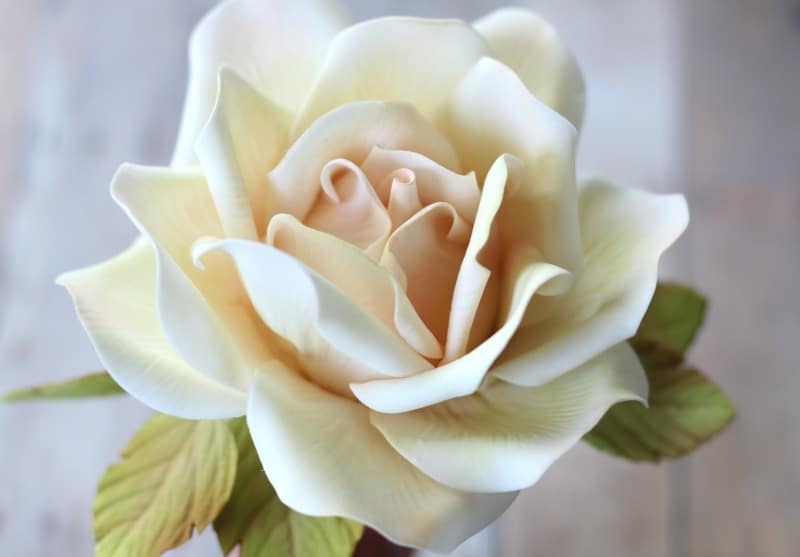 The gumpaste roses are fine to put on buttercream. Just attach them a couple hours before the event and they should be fine. 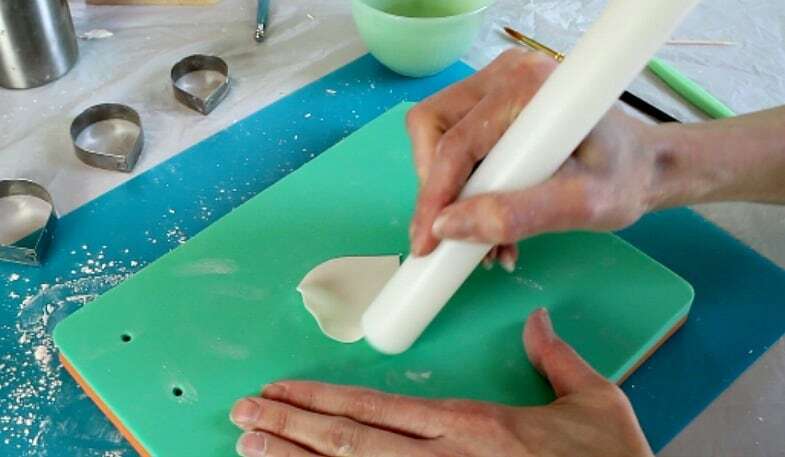 What brand of gum paste do you use, or do you make your own? I normally just use the Wilton brand, but I’ve used Satin Ice before and it works as well. Beautiful Roses!!! Of all the tutorial out there, your roses are the best! I do have a question about the size of the cutters. I have a 10 piece set of rose petal cutters and the largest fr mine is about 4 1/2″….Could you tell me the size of your cutters….I tired to determine them by the size of the veiner (which I have purchased :)). Thanks a lot! Hi Kara, I’m wanting to learn to make cake toppers and flowers. Yours is so much better than using the rose cutter thing and rolling it around. Also have you tried wafer paper yet? Hey yes! I LOVE wafer paper. I covered the front of a middle tier on a wedding cake with wafer paper flowers. They’re so delicate looking. Anyway I’m hoping this tutorial helps you! Thank you for sharing your techniques . I tried it and it came out so life like ! I’m so happy . Just a question , how do you get it to stick to the ball well ? It seemed to want to fall off the ball ! Any tips ?? Oh I’m so glad the tutorial helped! I just use water to attach mine to the styrofoam ball. I have better luck when I use the styrofoam that’s really smooth. I’m not sure what kind of styrofoam that is, but it seems like those balls come in two different types. One that’s really smooth and dense and doesn’t have a bunch of holes in it and the other kind is really bumpy with lots of holes. I hope that made sense. Anyway, you can use either kind, but I find that if I use the second type, it’s hard for me to get my fondant to stick. 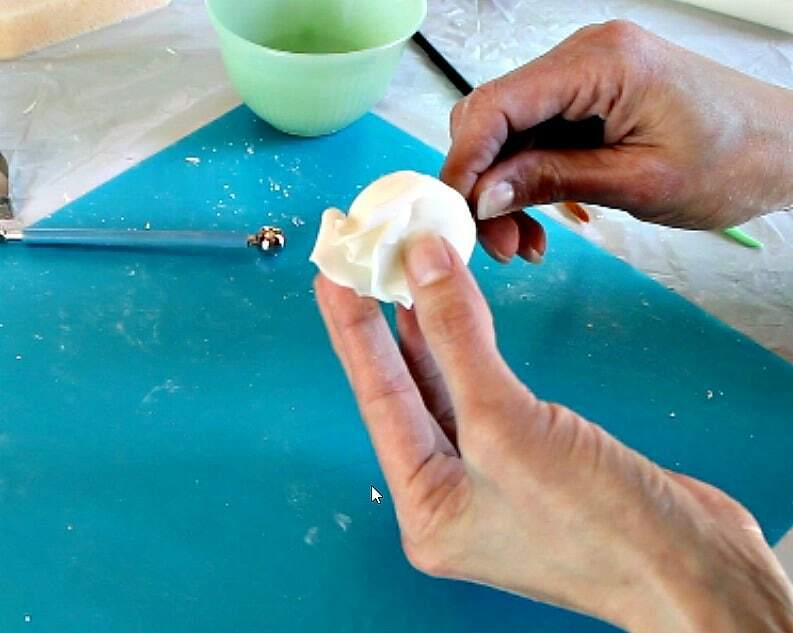 If you did use the more solid styrofoam and still had trouble, instead of using water to attach it, you could use egg whites. They get really sticky. Just brush that on instead of the water. 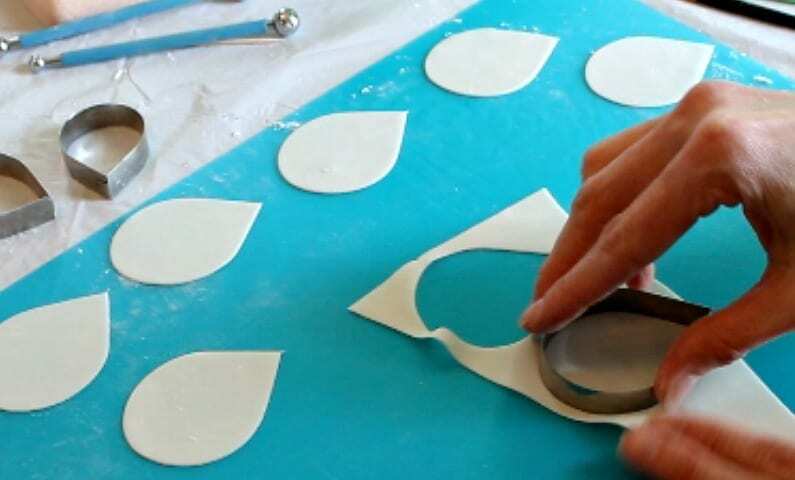 Another option is to dissolve a tiny amount of fondant or gumpaste into your water and then use that as the glue. That’ll be a bit more sticky than just water. I hope this helps! I will try to find that smooth ball . I’m just gonna order a ton now that I’m hooked on making these ?. Thanks for all your help ! Sometimes they’re hard to find. I think I found them once at Walmart and then had to get them from Amazon. I’ve got a link in the post and it should be to the smooth ones. And yeah, I order a big bag at a time. Sometimes you can even get them in multiple sizes all in one bag which is handy for making all different sized roses.